Salesforce is a CRM platform that allows small businesses to manage all of their sales, marketing and customer service communications in one place. Launched back in 1999, it has become one of the most popular platforms of its kind. Part of the reason that Salesforce has become so widely used is the ability to completely customize the experience through the use of third party apps. The marketplace features apps for managing marketing processes, accessing analytical data, scheduling and more. 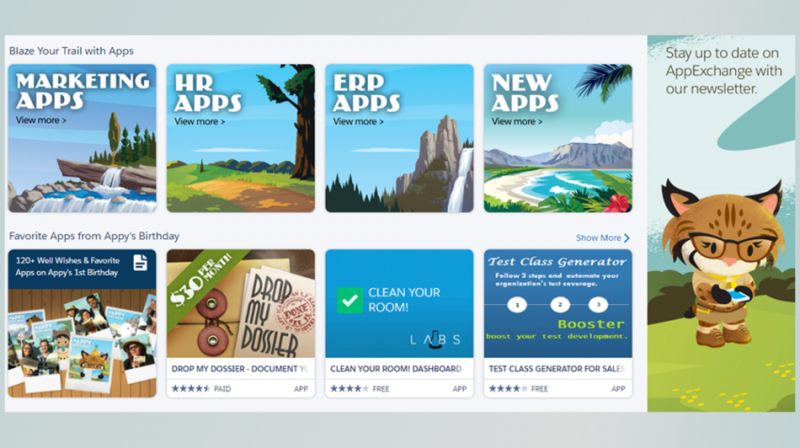 To access these apps, you can browse or search within the AppExchange marketplace and then purchase or download the ones you want to use right from the site. If you’re looking to add some new apps to your Salesforce experience, here are some top choices to consider. The top email marketing and mass emails tool in Salesforce, Campaign Monitor lets you quickly add your customer records and keep an eye on subscriber activity, from opens and clicks to opt-outs. The free tool is fully integrate with Salesforce and gives you one of the easiest ways to manage mass communication with customers via email. From Salesforce Labs, this free tool gives you the answers to 10 of the most common and helpful questions you might have about your customers, including where they’re located and which customers have been updated within the past week. Essentially, it gives you a free and easy way to access insights that could help you shape your sales and marketing tactics. Formstack is an app that allows you to build forms without coding. It’s a Salesforce-native program that lets you collect data online or on mobile with just a few clicks, so you can easily find out more about your customers and then use that data to better serve them or shape your new products, services or marketing initiatives. It costs $79 per user per month. A free app, Eventable offers a simple interface for custom calendar notifications. You can send events to contacts, manage events in your own Google, Outlook, or iOS calendars directly within Marketing Cloud, and embed calendar buttons. This gives you one centralized dashboard to do basically everything related to your schedule and even view analytics about how your contacts view and interact with events. For businesses that send invoices, this tool essentially helps you organize all of your invoices within Salesforce. You can already keep your invoices within Salesforce, but without the app they tend to be scattered across different accounts. Invoices automatically pieces those documents together and allows for batch invoicing for $49 per user per month. From Sage, this HR tool is meant to help mid-sized companies manage their employees, onboard new team members and even set up payroll solutions. At $120 per employee per year, the tool can also integrate with other third party applications to ensure easy processes. Pitcher Impact is a sales tool that helps salespeople to manage their contacts offline and access your company’s sales or marketing materials for presentation or pitches quickly and easily. The benefit of this tool is to empower teams while also giving business owners access to analytics and other helpful sales data, at a price of $20 per user per month. For those businesses that want a better way to measure ROI and the real impact of their various marketing efforts, Bizible offers an app for doing just that. The program, which costs $1,000 per company per month, offers revenue attribution technology that helps B2B marketers gain insights into the customer journey to find out exactly what is driving their company’s growth. This finance oriented application suite lets you and your business partner manage closed loop processes through Salesforce.com and the Partner Portal. Channel Finance includes tools for managing pricing, rebates and overall funding needs. Channel Finance is offered through Salesforce Labs and is free to use. Simpplr offers an employee portal that you can use to enable easy communication across your entire company. At a cost of $8 per user per month, the tool can help you encourage creative collaboration and set up processes for delegating and managing projects.